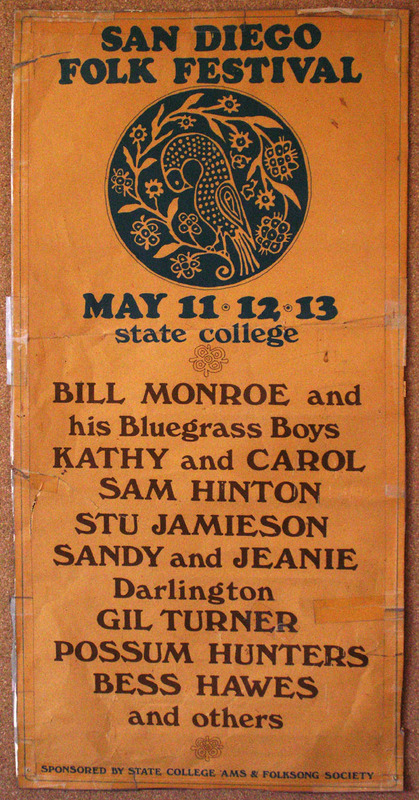 The 1st San Diego Folk Festival was held at San Diego State College in May of 1967. Click here to see a Poster from the 1st San Diego Folk Festival. Here is some sample music from that 1st San Diego Folk Festival. The Possum Hunters performing Lazy Farmer Boy. Stu Jamieson performing The Blue Goose. Gil Turner performing The Devil’s Baptizing. Kathy Larisch and Carol McComb performing John of Hazelgreen. Stu Jamieson performing Trouble On My Mind. Sam Hinton performing Billy Grimes The Drover. Kathy & Carol performing Crazy Arms. The Possum Hunters performing Bull At The Wagon. Sandy and Jeanie Darlington performing The Lion And The Bird. Sam Hinton performing Muleskinner Blues. Gil Turner performing Carry It On. The Old Reliable Egg Preserver Jug & String Band & Janitorial Service performing Deep Elum Blues. Sam Hinton performing It’s A Long Way From Amphioxus. Sandy and Jeanie Darlington performing Closin’ Time. **Pictured in the photos above, from the top: Pam Ostergren plays before an audience in Peterson Gym; The Possum Hunters – Dave Polachek, Ginnie Wickham, Gurden “Wick” Wickham, Graham Wickham; The Eddystone Singers – Leslie Kapp, Pat Rusconi, Walt Richards; Sam Hinton; The Blue String Grass Boys – Doug McKee on guitar, Bob Leech behind playing banjo, unknown bass and mandolin players; Curt Bouterse.